Snowshoe trails cover hundreds of miles in the State of Maine. Although Maine is spectacular during the summer, it comes alive with quiet beauty during the winter months. Many residents and visitors love the chilly weather and abundant snowfall that winter brings. Snowshoeing enthusiasts have hundreds of miles of trails to explore across the state. Enjoy snowshoeing treks through hardwood forests or craggy mountains for a fresh winter experience in Maine. Maine offers a variety of state parks, land preserves, and privately managed trails suitable for snowshoeing. Many cross country ski trails permit snowshoers to use the same path as skiiers. When snowshoeing on a cross country ski trail, avoid stepping in the tracks made by the skiiers. Stay to the side of the trail to avoid disrupting the ski tracks. Acadia National Park, located in the Midcoast region, offers over 45 miles of carriage roads. These roads are excellent for snowshoeing and lead through a variety of wilderness areas. Snowshoe through hardwood forests or walk to the coastal cliffs for a wintry view of the ocean. Snowmobilers are also permitted to use carriage roads and unplowed park roads, so stay alert and to the side of the path. Many of Maine’s state parks are available for public access through the winter. Baxter State Park, located northwest of Millinocket, is a premier winter recreation destination. It features dozens of miles of trails accessible to snowshoers. The extreme winter weather conditions make it unwise for snowshoers to attempt to summit any mountains in the area. However, many trailheads lead through forests, along streams, and near frozen waterfalls. Grafton Notch State Park in western Maine has miles of excellent snowshoeing trails. Snowshoers can hike up to Table Rock, a large flattened ledge directly across from Maine’s third-largest mountain peak. Table Rock affords spectacular views of nearby mountains and lakes. Aroostook State Park in northern Maine features dozens of miles of trails through the North Maine Woods and near the Allagash Wilderness Waterway. Consider hiking to the summit of Haystack Mountain for 360 degree views of the surrounding wilderness. Other state land with spectacular snowshoeing opportunities include Bradbury Mountain State Park, Holbrook Island Sanctuary, the Four Seasons Adventure Trail, Mahoosuc Public Reserved Land, Mt. Blue State Park, and the St. John Valley Heritage Trail. Many of these state parks and public land areas charge a fee for entry. Although dogs are permitted on many state-owned lands, they are not allowed on certain skiing and snowshoeing trails. Check with a park ranger for more information. The type of snowshoe you use depends largely on personal preference. Some snowshoers prefer the traditional wooden models, which are available for purchase online and through some outdoor recreation stores. Wooden snowshoes work well in Maine snow, but they may be prone to cracking or warping if not cared for properly. Many showshoe enthusiasts prefer modern aluminum or composite snowshoes, which are lighter and may give you better traction than wooden snowshoes. 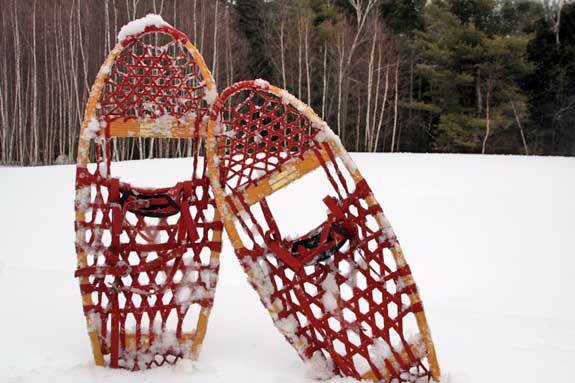 Some composite snowshoes allow you to attach a 4 to 8 inch tail, improving your ability to stay afloat in the snow. Before purchasing a snowshoe, consider the type of snowshoeing you most enjoy. If you like hiking through rugged terrain, look for a model with sturdy bindings and crampons to increase your traction. If you do not own snowshoes, they are readily available for rent from a variety of sources. Local outfitters typically rent snowshoes for $10 to $20 per day; children’s snowshoes often cost less. When snowshoeing in Maine, be prepared for uncertain weather condition. A day that begins with relatively mild temperatures may be the center of a fierce snowstorm by evening. In addition to wearing sturdy snowshoes, bring a day pack with essential trail items. Find a topographic map of the area you are hiking, plenty of water, extra food, a flashlight, and a first aid kit. If you are in an area with cell phone reception, be sure to bring your phone in case of an emergency. Wear sturdy snow boots, snow pants, a winter coat that breaks the wind, a warm hat, and insulated gloves. Layering the clothing under your outerwear allows you to better regulate your body temperature. Hiring a Registered Maine Guide is an excellent way to ensure a high-quality snowshoeing experience. 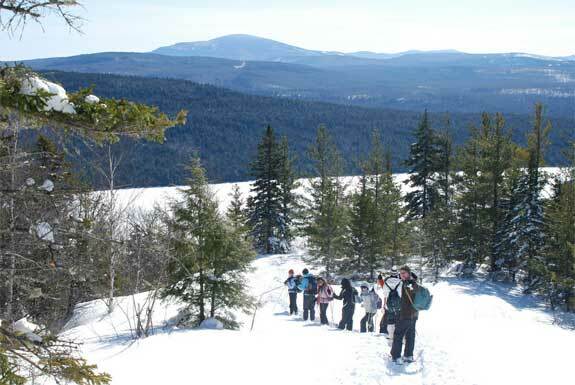 Registered Maine Guides are required by law to have several years of wilderness experience, giving them the skills to lead you on a guided snowshoe hike. Guides spot wildlife, animal tracks, and interesting natural features that you may miss on your own. Look for snowshoe hares, rabbits, fox, and while you listen to winter birds chirping in the trees. If you are lucky, you may even spot a moose. A half-day guided tour with a registered guide typically costs between $25 and $50 per person. Visit the Maine Professional Guides Association website to find a snowshoeing guide in your area. Snowshoeing in theThe Nature Conservancy’s Debsconeag Lakes Wilderness Area, just south of Mt. Katahdin and Baxter State Park.